Growing herbs, flowers, or vegetables in a hydroponic garden is very economical. You will save water, effort, and time. However, just like for herbs, flowers, or vegetables in soil, you will require the best hydroponic nutrients to get the richest harvest possible. With thousands of nutrients for hydroponic out there, looking for the best nutrients isn’t an easy task. It can especially be a tall order to a new grower because all elements need to be water-soluble. You cannot use the manure from your compost pit. You require nutrient solutions. That is why we researched and reviewed the ideal hydroponic nutrients in this post for you and other new growers. 2 What Are Hydroponic Nutrients? 3.4 Made-for-Hydroponic Products or All-Purpose? 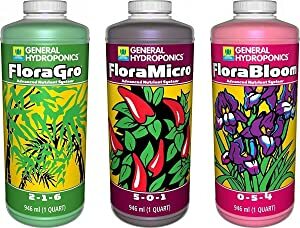 Flora line is the most famous product from General Hydroponics, a reputable brand that has supplied hydroponic products for decades. This set comes with three bottles, namely the micro, bloom, and grow. Why the three bottles? It’s because your plants and their growth stage will need different macro- and micronutrients at different ratios. Although you can use a single bottle for the entire growing phase, it is better to mix them to bring the best results for your plants. How these nutrients work is clearly shown on the bottles. You only need to mix the liquids from the bottles to fit your individual plant and its growth stage. The product is recommended for weed. Perfect for beginners and hobbyists. Suitable for all hydroponic plants and different growth stage. Note: if you are a beginner and knows nothing about hydroponic nutrients, this is the package for you. 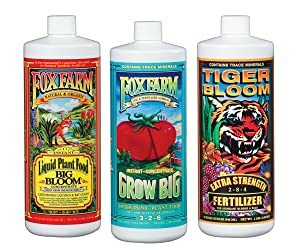 FoxFarm, a firm that has been in business for decades, is reputable as a soil nutrients supplier. However, as the hydroponic growing expanded, the company ventured into hydroponic product production (which are also perfect for use in soils). The firm’s Fx14050 trio line is a three parts package like the General’s one. With that said, the nutrients formulas, as well as the mixing ratio of their bottles for your plants and their growth stage, are different from the General. Again, the bottles come with clear instructions on how you should mix them, and you can also find these instructions on the company’s website. Comes from a trusted brand. Perfect for all plants as well as for different growth stage. Not efficient for commercial use. Note: FoxFarm is an amazing alternative to General Hydroponics. It provides great results. 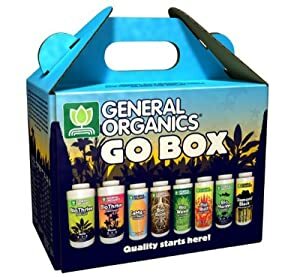 The General Organic Go Box from General Hydroponic features premium plants foods as well as supplements all in a single box. The box includes sixteen ounces of 2 fertilizers and eight ounces sample of Go liquid supplements. The box weighs about 7.3 pounds and measures 9.2 by 6 by 7.4 inches. As we noted, organic products cannot be said to be a 100% organic and this product hasn’t been certified either. But do not expect perfection. This box is a close as you will get an organic hydroponic product. And of important, your plants will fall in love with it. Includes all the plants’ foods and supplements. Doesn’t contain chelated acids and chemicals. Perfect for DWC hydroponic growing. Note: it is very easy to work with this box if you follow the given instructions for mixing the nutrients. Dyna-Gro liquid grow is an awesome general-purpose nutrient product containing all six essential macronutrients, as well as ten essential micronutrients that all plants need to grow healthy. Liquid Gro is perfect for houseplants, for fruit trees, for vegetables, and for landscape as it gives them healthy stem and leaf growth. It is perfect for rocky and poor soils and recommended for grown plants. 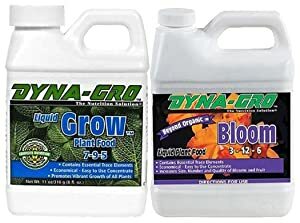 Dyna-Gro liquid bloom is a conc high phosphorus product containing all six essential macro nutrients as well as all ten essential micronutrients that all your plants require. You can use this product to enhance the color, number, and size of blooms produced. They can be used for all plants. They are for general-purpose, not for a specific need. Note: liquid bloom is perfect for orchids, potted flowering plant, and roses. The Humboldts is a liquid fertilizer that is ideal for most vegetables and flowers as well as for gardens or lawns. This is a conc mixture that can be mixed with water to provide 2000 gallons of fertilizer. The product increases your plant growth by triggering enzymes which enhances photosynthesis. 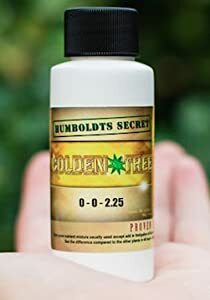 The golden tree was developed many decades ago and is still a great base nutrient fertilizer that is perfect for your entire garden. You can add this fertilizer as a foliage spray or a soil drencher to give new life to your garden. The product features organic material and kelp, carbs, and amino acids. Can be sprayed or added to the root. Note: it decreases veg time by about 50 percent and improves yield by about 20 percent. As we said, a powdered product is more economical because it doesn’t contain water in it, hence lighter. These products are also cheaper and easier to carry around. This is what you get when you get the maxigro maxibloom. It is a great product for farmers who prefer the powder form of the hydroponic nutrients. 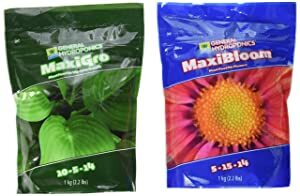 You can select the one-part maxigro and use it for growing your plants (whole season), but we would recommend you get the 2 parts of the product for the best results. One thing to remember is that you shouldn’t premix the product, just put in in your reservoir and then stir – otherwise, you will experience a precipitation issue. Last longer than liquid form. Note: it is not recommended for beginners as it might be a challenge to mix it. 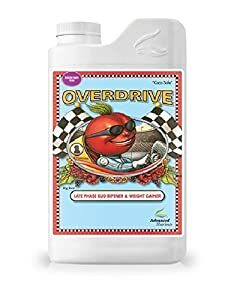 Overdrive fertilizer is an ultra-premium flower enhance with an extensive and complex array of potassium and phosphorus sources. Catalytic and hormones agents are added to pack on extra weight and girth that produce unrivaled oil and flower production during the vital last weeks of flowering when your plants display most sizable gains. The product keeps the plants at maximum performance and is recommended for tomatoes. The fertilizer assures you of getting a prize-winning product due to its unique set of flower enhancer ingredients that stimulates your plants to hit their ultimate potential. The best thing, it allows your plants to take nutrients better and improve their photosynthesis as well as energy. They also became resistant to pests, diseases, stress, heat, and drought. Improves creation of internal floral. Increases your plant weight during the last stages of growth. Note: it gives your plants the much-needed energy to produce in late bloom-cycle. This is an extremely strong liquid garlic produced from powerful garlic cloves. The garlic features natural sulfur for repelling mosquitoes. Because mosquitoes have soft bodies, the product becomes toxic to them due to the high concentration of garlic juice. The smell of the liquid spray chases the mosquitos away from your hydroponic system and they stay away if the smell is still in the air. While humans cannot detect the sprayed garlic juice, the mosquitoes usually detect it within seconds. This is because of their highly sensitive antennae, that senses 10,000 times better than people. 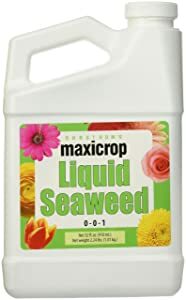 In addition, when you mix this product with soybean oil and water, it coats any stagnant water around your garden with a thin layer of natural oil. It doesn’t kill butterflies or bees. The mosquitoes return when the smell is worn out. 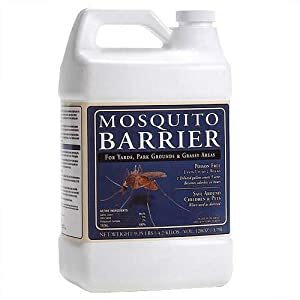 Note: this product doesn’t harm plants, pets, or humans, but it is harmful to mosquitoes. 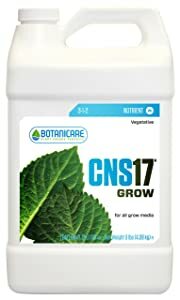 Botanicare CNS17 is an outcome of an innovative tech that enables you to make a professional strength, a single part nutrient with all the needed mineral ions in the right amount. The product uses polysaccharides in a set process to give your plant 17 essential nutrients found in a single formula. Once you dilute the product, the fertilizer provides the benefits of becoming an energy source for plants and beneficial microbes. What you will love about this bottle is its amazing price – it costs almost half of what its rivals cost. This high yielding product provides everything your plants requires in just one grow, bloom, and ripening formula. It is highly concentrated and is recommended for commercial growers as well as hobbyists. Provides critical elements to your plants. Support heavy flowering and fruiting. Note: the product also contains trace minerals, sulfates, and calcium to offer balanced nutrients to your plant. The Maxicrop 1001 liquid seaweed is a stimulant that stimulates cell development and results in vigorous growth. It is perfect for stem and root growth to ensure that your plant grows in a healthy manner. The product features critical elements that make your plant to grow including enzymes and enzyme systems. You can use this product for all types of plants and is perfect for your garden. Results in healthy stem and roots. Note: this product injects new life to dying crops. Plants need nitrogen, phosphorus, and potassium or N-P-K, and other trace components or nutrients to grow. A hydroponic nutrient is a liquid version of N-P-K, with other macro elements and nutrients (secondary) such as trace minerals in different quantities. These secondary nutrients are often varying degrees of magnesium, calcium, and sulfur. The liquid form of a hydroponic nutrient allows them to be applied straight to the root of a plant. They are mixed with water in hydroponic nutrients reservoirs and applied to the root several times a day. Note that some hydroponic nutrients come in powder form, although most of them come in liquid form. If price and ease-of-use are your two most vital criteria, the one-part hydroponic nutrient might be the perfect choice for you. You don’t need to mix anything. You don’t need to worry about the type of plants you have or their stage of growth. However, it has a shortcoming in that you don’t give your plants their full potential for growth. It’s not an effective purchase for different types of plants or vegetables. And that’s why we cannot recommend it for you. If you want the best solution, you should go for a three-part nutrient brand. But that means that you will trade the convenience for control of the hydroponic nutrients by customizing the mix to fit your different plants. The liquid nutrients are frequently used by hobbyists and starters as they come premixed and are easy to apply. However, they are more expensive than the powdered ones. Dry or powder nutrients are more economical since they don’t contain any water in them. They also last longer than the liquid ones. With that said, powder nutrients are suitable for use in commercial greenhouses – that’s when they become even more economical. In addition, they are more efficient if you have enough skill using them and if you grow large plantations. Just like liquid forms, there are some premixed powder nutrients on the shelves today. These are great choices for hobbyists who prefer powder form and want ease-of-use. All you need to do is add it to the water, stir, and then add to your plants. Many growers prefer to farm the organic way with the hydroponic system. But although organic produces seem great for your health and the environment, they trade with the smells and their soluble problem when dealing with hydroponic growing. You should also note that most of the hydroponic nutrients on the market aren’t organic. You can only be guaranteed of getting organic nutrients if you buy the organic forms such as fishbone, blood meals, and others and add them to the solution. Even if the manufacturer states that their product is organic, note that they aren’t 100 percent organic as there are some types of refined minerals added. But if you get the organic produce for your hydroponic system, they will work tremendously. And trading a little of your hassle for an organic nutrient for your hydroponic garden is 100% worth your time. Many manufacturers produce a one-size-fits-all nutrient kit. Do not buy this kind of nutrient. For all-purpose nutrients that producers say to work for all set up whether hydroponic or soil, don’t purchase these. To get the best yields, buy a product that is made for hydroponics. Hydroponic nutrients cater for a specific need. You need to choose the right type of nutrient according to your plant’s stage of growth. Vegetative phase – Your plants will require lots of nitrogen to produce leaves and grow taller. Flower or mature phase – Your plants will require more potassium and phosphorus, plus magnesium and calcium to bloom. Give them 15% nitrogen, 30% phosphorus, and 30% potassium or a ratio of 15-30-30 for flowering and fruiting. The best nutrient products come with instructions for which solution to use for various growth phases of your plant. The best way to mix hydroponic nutrients is to follow the producer’s instructions. Different brands come with different formulas. And it is best to mix them with the instructions you see on the packages, or on their websites. For beginners, you should try a dosage lower than the one recommended. Adjust it when you become a professional. After a while, the nutrients solution will reduce their concentration. That means your plants will lack the required nutrients. You should do an Electricity Conductivity (EC) to determine the concentration of all nutrients of the solution. It might be difficult to measure the ppm (part per millions) of every nutrient in your solution, but you can know the total ppm of all nutrients easily. It will show the ppm of nutrients in your hydroponic product. The simplest way to measure ppm is to use an accurate digital ppm meter. Dip your meter into the solution and then take the reading. Generally, EC should be 1000 to 1500 ppm, but it will depend on the plants grown and the age of your plants. You will require higher ppm as your plants get bigger. The pH level of your hydroponic garden needs to be kept balanced during the entire duration of plants growth so that the plants can receive the right nutrients. Note that if the pH is unbalanced (too high or too low), the vital nutrients will be locked-out and your plants won’t take them. Therefore, monitoring pH changes is vital. You will know when to adjust the levels of the solutions before your garden and plants suffer. The recommended pH levels are 6.0 to 6.5. Use a pH meter to determine the pH and adjust the pH accordingly. Here are some important tips that will help you to narrow down your choices when buying your hydroponic nutrients. Nitrogen, phosphorus, and potassium should be present in the product you want to purchase. They allow your plant to grow healthy and even increase the yield. At different phases of growth, your plants will require different nutrients. They require high nitrogen, high or medium phosphorus, as well as high potassium during the vegetative phase. On the other hand, they will require low nitrogen, high phosphorus, as well as high potassium during the flowering stage. Liquid nutrients are better than powdered ones as they are very easy to use. Powdered nutrients are complicated when mixing, although they are cheaper. If you want to grow organic plants, you should get organic nutrients (they are also environmentally friendly). Chemical nutrients are preferred if you want to get your results faster. Q: How many times should I change my hydroponic nutrients solution? A: Most growers recommend you change your solution at least once per week. Use an EC or TDS (total dissolved solids) meter to test the part per millions of your solution to find out if it is getting low or full of salts. Q: Which is better, synthetic or organic nutrients? A: There are pros and cons to both synthetic and organic formulas. Some growers argue that organic solutions lead to more clogs and buildup. Some people prefer them because of their health benefits. Q: What is ppm, and why is it applicable to many things? A: Parts per million (ppm) is a measurement of TDS in your solution. It is also used to measure the amount of carbon dioxide present in the air of your hydroponic system. Q: Which water should I use in my hydroponic system? What nutrients ratio do I require? These questions will allow you to determine the best hydroponic nutrients for your hydroponic system and remember that brands also matter. 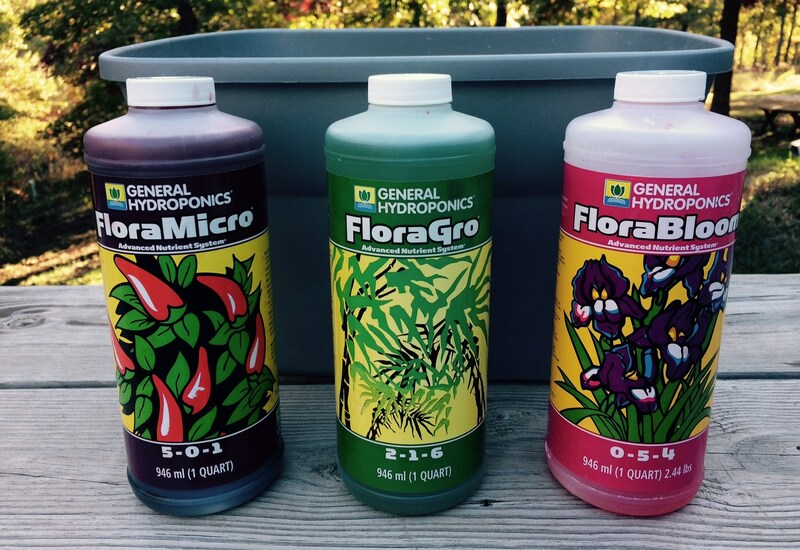 From our review, we would recommend you the General Hydroponics Flora Grow, Bloom, Micro Combo Fertilizer Set. It is perfect for all plants and comes with easy instructions.